Last week I received the first clip from the film. However, I was missing a trailer but that has been rectified (see below). Universal ash, as well, just released two more stunning clips. 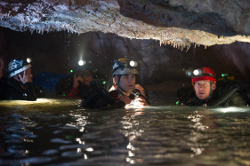 The 3D epic underwater adventure Sanctum, from three-time Academy Award®-winning executive producer JAMES CAMERON (Avatar, Titanic), follows a team of underwater cave divers on a treacherous expedition to the largest, most beautiful and least accessible cave system on Earth. When a tropical storm forces them deep into the caverns, they must fight raging water, deadly terrain and creeping panic as they search for an unknown escape route to the sea. The 31st RAZZIE nominations announced. INDY filmmaker needs YOUR help! L.A. is our only hope!